The complete version of the curriculum the currently valid version of the curriculum. It is for informational purposes only and is not legally binding. The legally binding version of the curriculum, including any amendments, may be found in the University of Innsbruck Bulletins. VO Scientific Working Skills in Political Science (CM 1 lit. b‚ 2 hrs., 5 ECTS-Credits). (3) Before successful completion of the Studies Induction and Orientation Stage courses amounting to 17.5 ECTS-Credits may be passed. The requirements specified in the curriculum must be met. The Bachelor's Programme Political Science, grouped among the social and economic sciences, offers vocational preparation for the social sciences, conferring the degree of Bachelor of Arts upon completion. The goal of the bachelor's programme is to provide graduates problem-solving skills based on scientific theories and methods. The bachelor's programme equips students with current and practical knowledge of national and international political systems and enables them to analyze such systems. Special attention is paid to sustainable social competences, the ability to work in teams, and the written and verbal presentation of results. 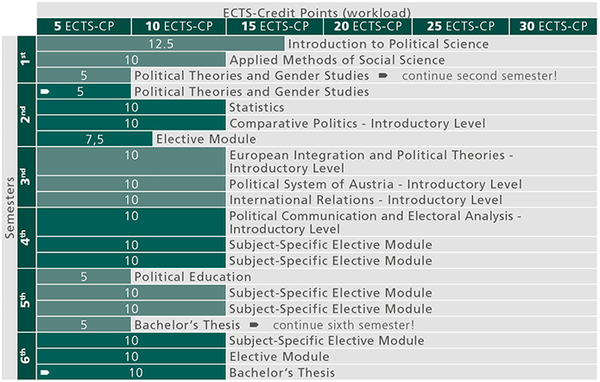 The Bachelor's Programme Political Science covers 180 ECTS-Credits, corresponding to a duration of six semesters. During this time, mandatory and elective modules, consisting of lectures (VO), introductory seminars (PS) and seminars (SE), are to be completed. After an introductory period, focusing on fundamental aspects of academic work, students acquire broad insight into the field of political science through introductory and advanced courses. Special attention is paid to areas such as European integration, comparison of political systems, gender research, political and social theories, the Austrian political system, media and communication, and international politics. Moreover, the bachelor's programme offers the opportunity to do an internship and to reflect on this internship in a course. To successfully complete the degree programme, students are also required to write two bachelor's theses associated with two seminars in the advanced modules. The workload of each thesis amounts to fifteen ECTS-Credits. Graduates have demonstrated knowledge of their understanding of political science and related fields. They are able to use this knowledge to develop scientifically sound solutions to practical problems, to assess and implement such solutions, and to apply their qualifications in a wide variety of occupational fields. They possess social competences, teamwork abilities, presentation and moderations skills, etc. Graduates of the Bachelor's Programme Political Science find positions in public administration; in political institutions and organizations; in public relations; in the media; in national, international and non-governmental organizations; and in university and non-university research capacities.